The next morning I woke up for Suhoor, and noticed something strange – my pants were wet! I couldn’t believe it; I felt so embarrassed, and didn’t expect to wet myself this early on in my pregnancy. I had heard of women losing bladder control when pregnant, but I didn’t expect it happen to me. After eating Suhoor, I prayed, read some verses from the Quran, and went back to sleep. I woke up a few hours later, and again I was wet! I was so embarrassed again, and so confused, as I was not even feeling the urge to have to go to the bathroom! That’s when I decided to tell my mom about my situation. As soon as I notified my mom of what was happening, she told me there was a possibility that my water had broken….something I didn’t expect at all! At this point, I was extremely nervous and scared. My mom also told me that she had experienced this when she was pregnant with one of my sisters; she was given an injection at the hospital and was sent home. For the rest of her pregnancy, my mom had to be on bed rest and had a healthy baby at full term. I felt a little better after hearing that, and called the hospital right away. The receptionist on the phone seemed quite eager for me to rush to the hospital, and told me to bring along my clothing items that had gotten wet over the last few hours. Arriving at the hospital, I went straight to the maternity ward where I was admitted and put into a room. After changing into a hospital gown, a friendly nurse came in and told me she was going to run some tests from my wet clothing items to determine if my water had broken. After some time, the nurse came back in and told me the results proved that my water had in fact broke, and the next step was for me to have an ultrasound. After all the procedures and tests, I anxiously awaited for the doctor to come in, and to give me the injection so I could go home and finally rest. 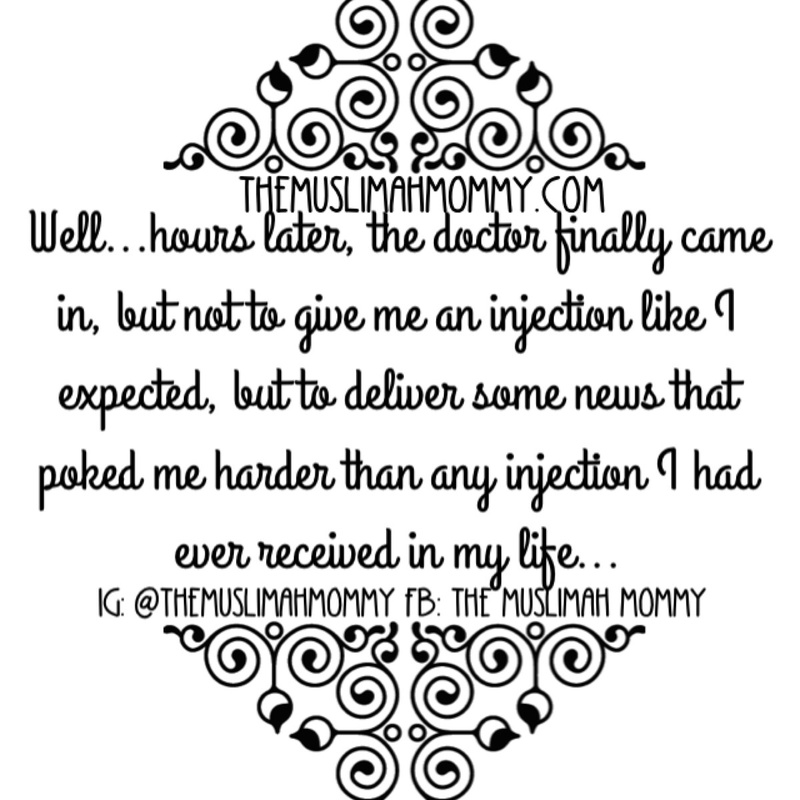 Well…hours later, the doctor finally came in, but not to give me an injection like I expected, but to deliver some news that poked me harder than any injection I had ever received in my life: I was going to have a premature baby and there was nothing anybody could do about it! My legs started to shake uncontrollably, and I couldn’t find any words to come out of my stale dry mouth for a response. A few seconds later, I asked the doctor why my water had broke, and she said ninety-nine percent of the time the reason is unknown; it could have been because I was stressed out during the entire pregnancy due to the fact that it was (un)planned, it could have been because I was fasting, it could have been because I had walked for an entire day the day before around the university campus, or a combination of all the events… Then the doctor told me that from the test it was obvious I was already having contractions (which was another surprise as I didn’t feel anything except for the occasional sharp pains I had felt since being in my fourth month of pregnancy, and that my obstetrician dismissed as nothing major). The surprise news didn’t end there: I had to be transferred to a hospital located on the other end of the city, as this hospital (where my obstetrician delivered and in which was the nearest hospital to where I was living) did not have the equipment to take care of premature babies once they were born – which meant some unknown doctor was going to deliver my baby and there was a possibility it was going to be a male! I had the sudden urge to throw up- and this time it was not due to morning sickness! Before I left the hospital, I was put on an IV in an attempt to avoid getting an infection. After two failed attempts to get the IV in my arm, the nurses decided to put it in my hand; and although putting it in my hand was a painful experience, it was finally in. Next, I travelled to the other hospital via ambulance and was put into a maternity room with three other women. All of the other women were allowed to walk around freely within the hospital, however I was not. The nurse had ordered me to strict bed rest, and the only place I could go to was the washroom, which was right next to my hospital bed. I have to admit, I was slightly jealous of the other womens freedom while I was confined to the cold, dull, lifeless hospital linens, and a steel IV pole attached to my hand via a very painful IV needle. A doctor came in after I got settled into my new hospital room, and my first request was to have a female doctor deliver my baby. There were no promises that I would get a female doctor, as it would depend on what day and time I would go into labour, and which doctor would be available that time – jump for joy, another surprise to (not) look forward to! Next, the doctor told me that I had to wait for a week for natural labour to take place, and if by the end of the week I did not go into labour, I would be induced – yippee, another surprise to (not) look forward to. Three days had gone by, and all I could think of was if I was going to have a female doctor deliver my baby, and if I was going to be induced or not. My contractions started getting more painful, and it was very difficult to fall asleep and stay asleep during the nights. During the days, I was getting quite bored, and not to mention my IV was stabbing me in my hand so much so, that whenever I moved my hand I just wanted to scream! I even avoided going to the bathroom because that meant that I would have to move my hand, and thus it would mean more pain. Fortunately, a nurse gave me some paint and some canvases for me to create some artwork on, and my hands were happily busy for a couple of days in creating a special something for my baby. keep smiling with the angels. OMG sister the same exact thing happened to me with my second the waters breaking and waiting for a week and the last day contractions started!! It is most definitely the scariest time. Waitingg for the next part ..